263 The Napinka Subdivision, Mile 0 to Mile 49. 1997/07, CPR Napinka Sub. mile 1.5 – view of same 3 span bridge looking from N.W. to S.E. from parallel road. (Click on photo for detail) © Text and Photos exclusive copyright of N. Froese. 262 The Napinka Subdivision, Mile 0 to Mile 49. 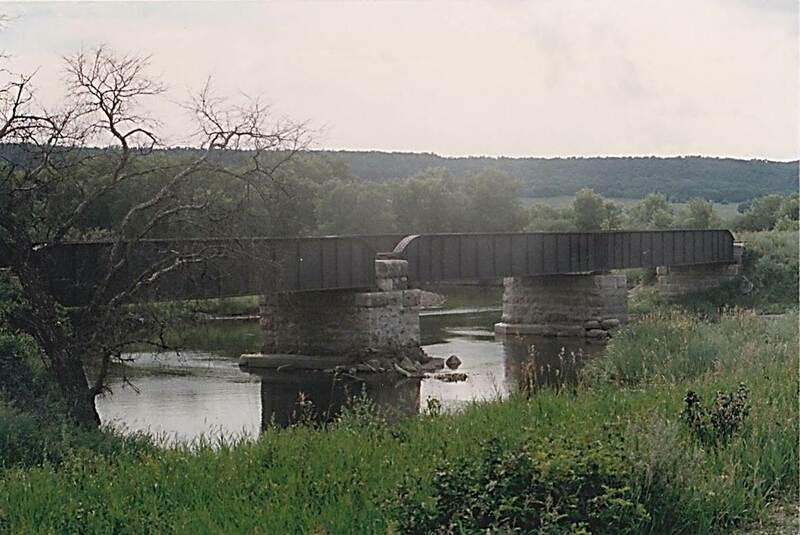 1997/07, CPR mile 1.5, three spans of the HDPG bridge looking from N.E. to S.W. across Pembina River. (Click on photo for detail) © Text and Photos exclusive copyright of N. Froese. 261 The Napinka Subdivision, Mile 0 to Mile 49. 2011/05, CPR Napinka sub. 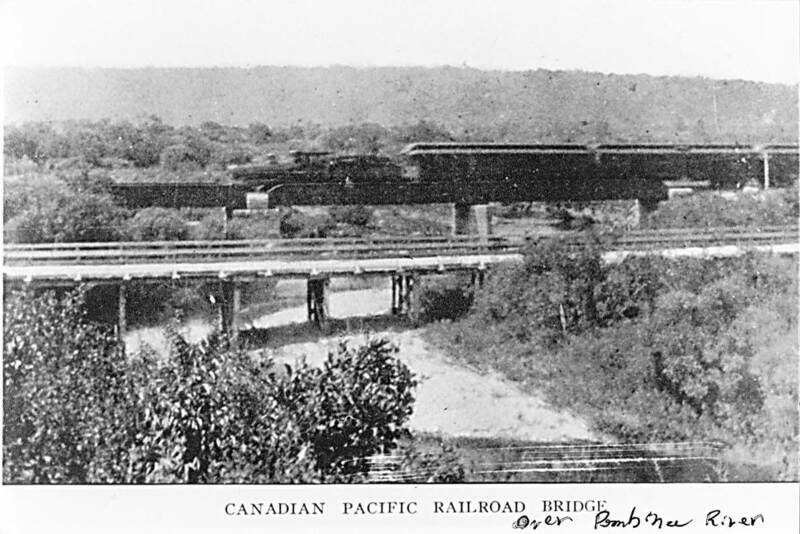 Mile 1.5, Hinged Deck Plate Girder (HDPG) bridge, length 195’, Three spans ( two built in 1898, and one in 1903). Water course – Pembina River. 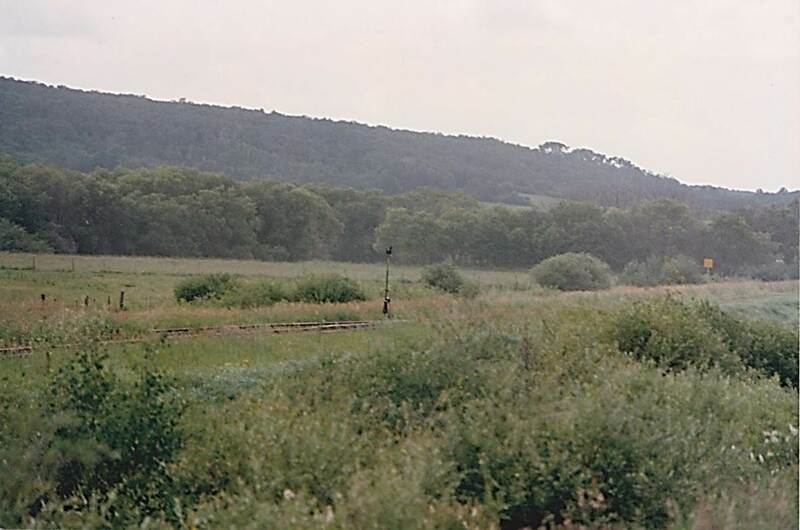 View looking west. (Information – BTRC/CPR files) (Click on photo for detail) © Text and Photos exclusive copyright of N. Froese. 260 The Napinka Subdivision, Mile 0 to Mile 49. 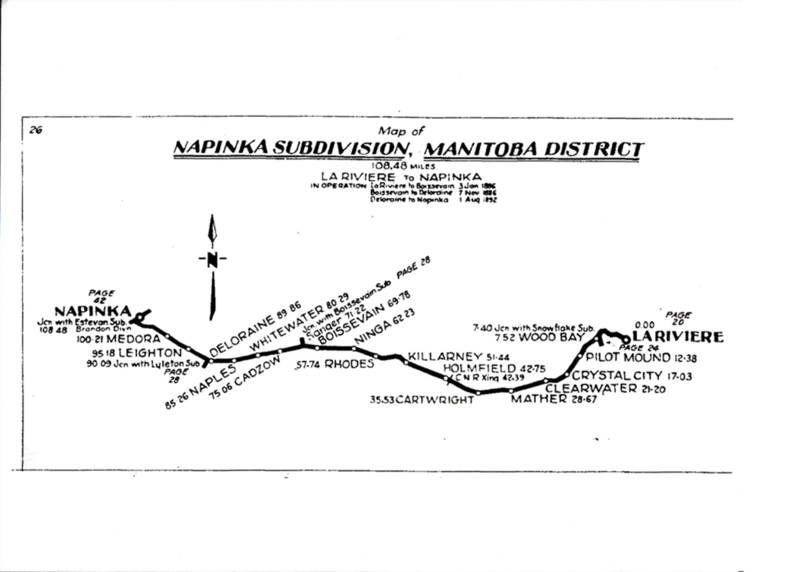 Early 1900’s , CPR mile 1.5 Napinka sub. W. of La Riviere. Coal burning Atlantic steam engine heading E. with a consist of clerestory roof passenger cars. The rail bridge appears to be a three span bridge as it exists in the present – 2011. 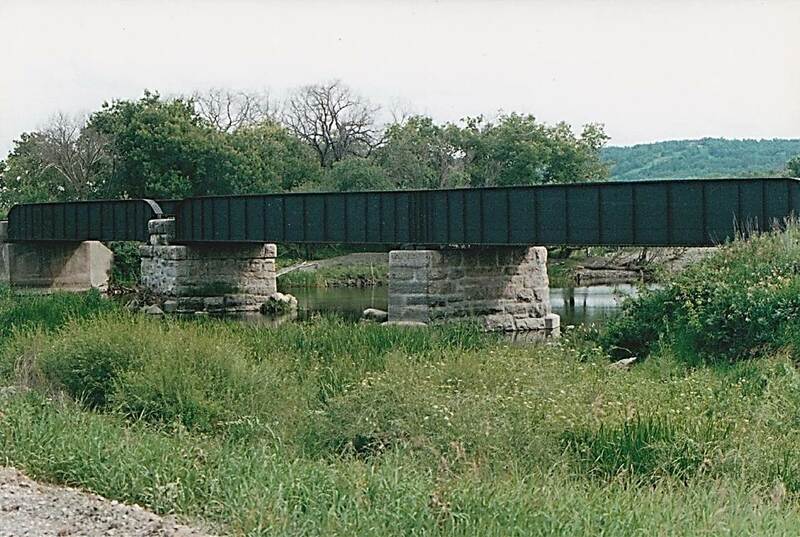 According to the CPR Napinka Subdivision Bridge List, a third span of this bridge was added in 1903. (Information – Manitoba Archives, BTRC/CPR files) (Click on photo for detail) Photo source from the collection of – N. F.
This entry was posted in Uncategorized on 2015-04-28 by nfroese. 259 The Napinka Subdivision, Mile 0 to Mile 49. Mile signs that were not found on the right of way for this presentation. 258 The Napinka Subdivision, Mile 0 to Mile 49. 257 The Napinka Subdivision, Mile 0 to Mile 49. 1997/07, CPR Napinka Sub. Mile 1. 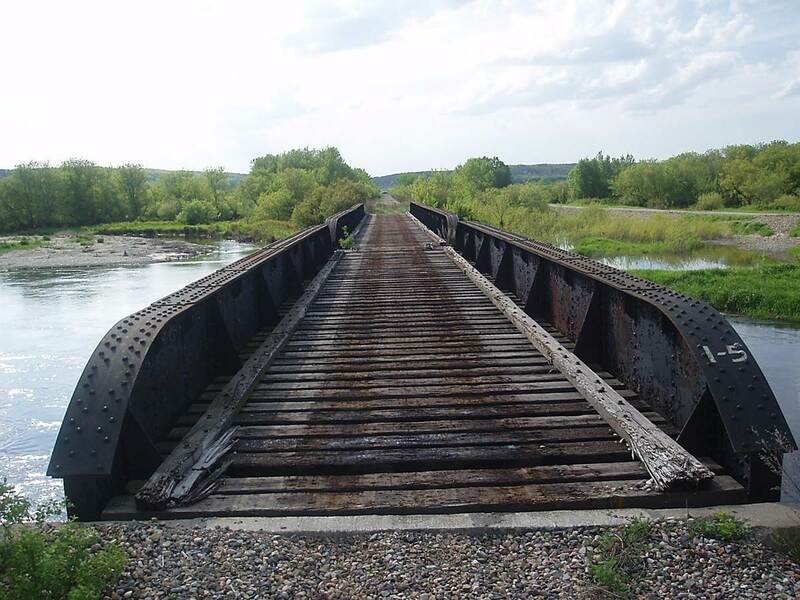 West leg of wye rejoining the main branch line which is headed W. across the Pembina River to the right. (Click on photo for detail) © Text and Photos exclusive copyright of N. Froese.